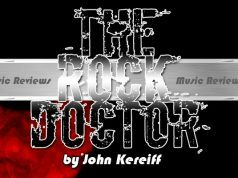 Music Reviews by the Rock Doctor - Jan 26, 2018 - Gonzo Okanagan Online News, Music, Technology, Sports, Film, Arts & Entertainment, Culture, Wine & Dine... Life! This new disc from Mick Kolassa is one swanky party. It’s a celebration of some of the greatest blues songs ever written, performed as duets with some of Mick’s musical friends. 13 songs in all here and, if you’re a blues fan you’ll recognize every single one of them- even money says you’ll really enjoy these versions too. 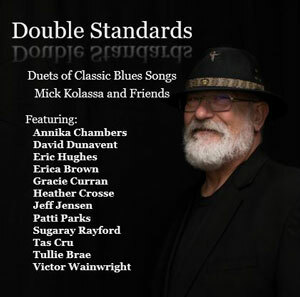 Kolassa’s love of many different kinds of blues is no secret, and Double Standards explores everything from down home to classic Chicago blues, to the jazzy stuff and blues rock too. And, as with his previous albums, proceeds from this disc go to the Blues Foundation’s HART fund and Generation Blues programs… great music for fine causes. And even though the playing is excellent, this is definitely a singer’s album. Double Standards was produced Jeff Jensen, recorded at Trident Studios in Memphis, and mixed by Jeff Bakos. The sound is warm, intimate and relaxed, inviting you inside the music with ease. Mick’s husky voice is quite likeable in the blues context, belongs on this music- a sort cross between Eric Clapton and Dr. John- and he’s chosen his singing partners well for this project. Particularly effective tracks include Key To The Highway with Eric Hughes and I Just Want To Make Love To You with Heather Crosse. A jaunty version of Spoonful with Erica Brown really swings, and everyone gangs up at the end for Ain’t Nobody’s Business. Double Standards is a collection of great songs elevated even higher by what everyone brings to the table, and it’s absolutely not to be missed. A 5 song E.P. here from this Montreal based roots rocker, a sort of John Mellencamp meets Steve Earle meets Barney Bentall that I’m digging in a big way. 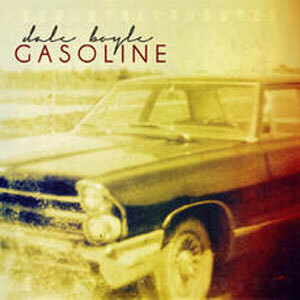 Gasoline is 4 originals with a cool cover of Heart Of Gold that you’ll really dig. Drawing on influences that include Springsteen, Fogerty and Petty, Dale has developed a song writing approach that is lyrically vivid and melodically driven, creating songs that stick with you. The title track of this E.P. placed 2nd on the Nashville-based “Unsigned Only” music competition. 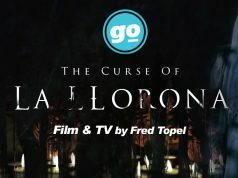 Dale is also a music researcher, educator and freelance writer. In academia, his PhD research at McGill University explored the role that music can play in teaching. So, not your average singer/ guitar player, then. Gasoline was recorded with drummer Kenny Aronoff (John Mellencamp, John Fogerty, Tony Iommi) and bassist James Lomenzo (Fogerty, David Lee Roth and more) in Los Angeles and Montreal. Maybe it’s Aronoff’s drumming, but sonically this disc feels closest to Mellencamp’s The Lonesome Jubilee era minus the fiddle. Produced by Boyle and mixed by Geoff Mitchell, who also played organ and piano, this is a short but driving collection of songs that is SO worth checking out. If you’re in the mood for some mid-west boogie ‘n’ blues, I believe I can help you out. 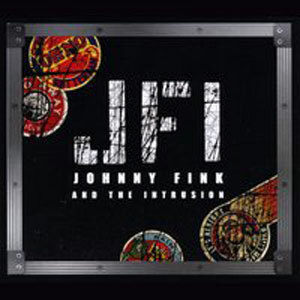 This is JFI’s self titled debut, and it’s a real toe tapper. Forming originally in the winter of ’92 as a 4 piece called The Blue Intrusions, Johnny Fink & The Intrusions have won a handful of regional blues awards in the Ohio area and placing in the top 8 at the 2017 International Blues Challenge in Memphis. The band is a tight, swingin’ trio; Johnny Fink on guitar, vocals and harp writes the tunes too… Matt Newman holds down the bottom end on bass, and drummer Doug Moore provides the tracks that this train runs on so well. Production by Fink himself is quite well done, nice and beefy with a thick bottom end that really punches you in the kidneys when you turn it up- trust me I know, and so do the neighbours on the other side of the duplex! The energy between Johnny, Doug and Matt when they play is palpable and their overall performance is real upbeat. The fast songs groove like crazy and are right in the pocket but it’s the slow numbers that really caught my ear on this one. All in all, a pretty well rounded blues record. JFI isn’t a perfect blues set but it is a soulful one, and that beats perfection every time. These R&B rockers from the Jersey shore celebrate their 10th anniversary with a blast of a new album. Soul Of A Man is a lively, energetic, upbeat mix of rock, soul and blues guaranteed to cure what ails you. 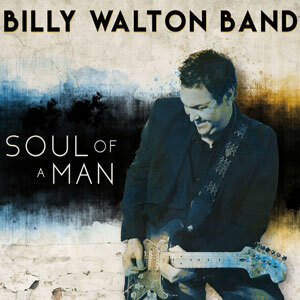 Soul Of A Man includes 11 original songs with covers of tunes by John Fogerty and Noah Lewis. I first put this on while puttering around the music room and found that by the time it was about halfway done I had stopped whatever I was doing and just listened to the disc. Love those punchy horn charts, the classic Asbury Park sound, and Billy Walton’s guitar playing is particularly satisfying. He changes from mood to mood as a player, from pounding out a rock riff one minute to coaxing a delicate blues lead out of his Strat the next. Of course it’s not just about Billy; we have to consider the contributions of drummer Johnny D’Angelo and bassist William Paris while Sam Sherman and Eric Safka add some tasty keys, and there’s a sizeable horn section too. They move together as a wave, jamming away on track after track. The only misstep, I think, is their cover of CCR’s Green River. Maybe it’s because I’m overly familiar with it as the title track to the first record I ever bought, but the horns sound out of place and Billy’s trying too hard to imitate Fogerty’s voice- but the guitar work is terrific. Soul Of A Man has some terrific songs and great playing, and we can always use more of that. Sovers’ new E.P. is a follow-up to his awesome 2016 debut, Songs Of A Renegade. 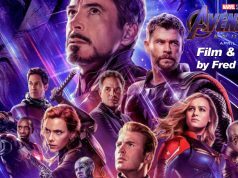 This is an extremely well played gaggle of tunes, blues and otherwise, a true celebration. You know, a Jubilee. “Jubilee is about heartbreak and overcoming heartbreak” Greg says. “You’ll hear acoustic music, you’ll hear music with the resonator. You’ll definitely hear a more eclectic sound of music compared to Songs Of A Renegade. The words are better and the playing is better.” Sounds good doesn’t it? That’s because it is. Greg Sover is a solid singer, emotional without giving in to histrionics, and he’s a really freakin’ good guitar player. Hailing from the Philadelphia area (they sure seem to know their blues), his band also includes bassist, musical director and co-producer Garry Lee, guitarist Allen James and drummer Tom Walling. Frank-John Hadley of Downbeat magazine refers to their vibe as a “thunder and lightning style”, and that’s just what I like in my blues. This disc has room for more than just that, though; witness the Caribbean vibe of I Give My Love. 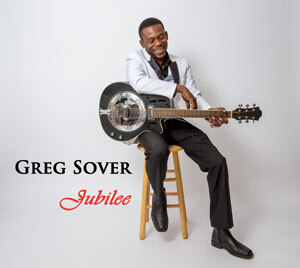 Greg Sover and his guys pack a lot of emotional oomph into the 7 tracks that make up Jubilee. He says the disc is about heartbreak and overcoming heartbreak, and by the time this journey is over you’ll find yourself in a hopeful mood. Great songs that really touch you where it counts makes Jubilee an uplifting experience.